Whenever I am at Trader Joe’s I have to buy several bags of these. I do this in order to run a series of scientific experiments (of course). How long will these bags of candy last? If I hide handfuls of them in random places, will I forget where they are? If I do forget, how long until I remember? If I were to write up my findings, the answers to these questions would go something like this: not long, probably not, not long at all. 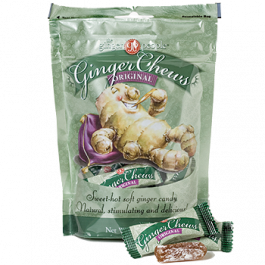 Somewhere along the line I convinced myself that because these candies are made with ginger, they are healthy. Ginger can help an upset stomach. If you have a bit of nausea, just eat some candy, makes sense, no? It does to me, so I am going to stick with this line of thought until someone can prove me wrong. Right now I am emjoying York Peppermint Patties that I keep in the refridge. Perfect treat on a hot summer’s evening. Ginger also helps loneliness, sexual frustration, germs, general annoyance, PMS and pregnancy….. PReTTY AWESOME! 🙂 I love these candies so much now, thanks to you. Also, I do not think I have ever said “candies” until now… thanks for broadening my culinary vocabulary. And, you are welcome, delicious candies.